If there’s any company out there that could be compared to Apple for its extreme attention to design and performance, it would be OWC. The company has already gained serious repute for its dedicated line of Apple accessories, and its new addition to the family solidifies that standard even more. With its simple yet extremely elegant built and high-performance capabilities, the OWC Envoy Pro Ex SSD deserves the accolades it receives, which includes being known as the USB 3.0 flash-based external drive out there. Whether you’re an Apple fan or not, waxing poetic about the OWC Envoy Pro Ex is not an option that can be easily avoided. It fills all the criteria for svelte and elegant in the looks department. 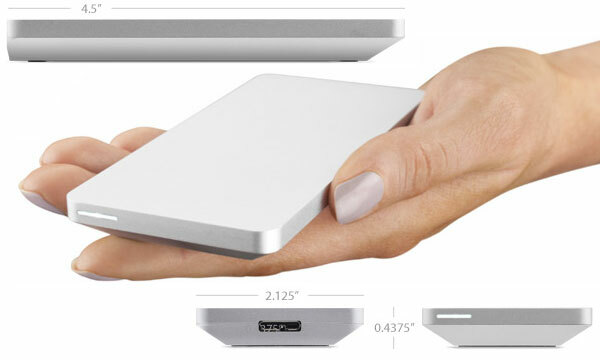 The solid-state drive boasts a solid aluminum casing (colored silver that’s reminiscent of Apple products) whose dimensions measure only 4.5 x 2.13 x 0.44 in. Talk about ultra-portability. The Envoy Pro Ex comes in two storage capacities, 240 GB and 480 GB, yet only weighs just less than 4 ounces, no doubt making some external drives in the market look clunky and outdated in comparison. To add to the luxury appeal of the SSD, OWC has even gone so far as to package the drive in a black cloth pouch that feels just as quality made as the drive looks. Still, the core of the Envoy Pro Ex is arguably its strongest draw. It bucks the trend and leaps into the realm of high performance by featuring the combination of an LSI SandForce controller and an ONFi 2 synchronous NAND flash. This highly advanced configuration guarantees transfer rate values that closer approximate the theoretical 500 MB/s of USB 3.0, perfect for dealing with large files or time pressure. To maintain the high bar already set by the controller-flash combo, OWC introduces its Aura Pro 6G SSD into the build. The SSD offers better data protection than OWC’s Enterprise class hard drive, about 100 times more, and provides foundation on which the SandForce controller and the ONFi 2 synchronous NAND can do their lightning fast voodoo. OWC’s new solid-state drive obtains power solely through a USB 3.0 connection, meaning a true plug and play experience and no AC adapters needed. The OWC Envoy Pro Ex SSD is available for purchase at OWC’s official website and other online retailers. The 240 GB version costs $319.99, and the 480 GB version, $599.99. This entry was posted in External Hard Drive, USB 3.0 Hard Drives and tagged Apple, Envoy EX, External Hard Drive, OWC, Solid State Drive, SSD, USB 3.0. Bookmark the permalink.